1. For FILEVERSION and PRODUCTVERSION, must use comma separator. This is important because usually an application using VerQueryValue gets the language-independent versions (FILEVERSION and PRODUCTVERSION values in the resource script) and not the localized ones (“FileVersion” and “ProductVersion” values). 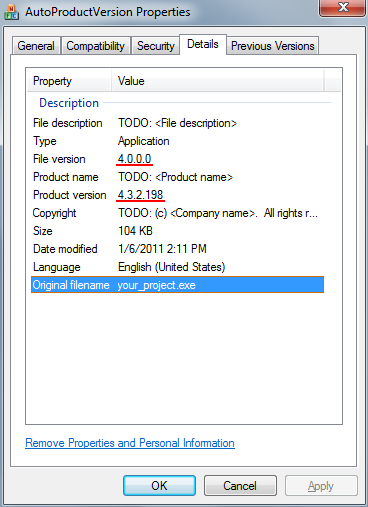 Just take a look in “Properties” dialog and note that, if using period and not comma, the shown file version is 4.0.0.0 and not 4.3.2.198 as expected. 2. It is not obviously necessary an external text editor to manually modify the .rc and .rc2 files. It can be directly performed from Visual Studio IDE: richt-click on file in solution explorer, choose “Open With…” menu item, then “Source Code (Text) Editor”. 3. This method does not resolve the problem in Setup projects (.vdproj).